There is all sorts of things I wanted to blog about but they all went out of the window when I got sidetracked by the release of Issue 2 of Fat Quarterly (go have a look, as in my humble opinion it’s a good one!) and a blog post I read a couple of weeks ago. I can’t remember for the life of me where i read it (I suspect it was a link, from another link, from another link) but it got me thinking. The lady said something along the lines of, her not understanding the current trend towards quick and easy quilts. It got me thinking a whole lot. Now I do understand that quick and easy is good for the times that you need to make a quilt as a gift and you need something that doesn’t take 3 years to make, or you need a utility quilt, but on the whole i would absolutely say that I’m with her all the way. Are a ‘process’ or a ‘product’ quilter. Why do you quilt? 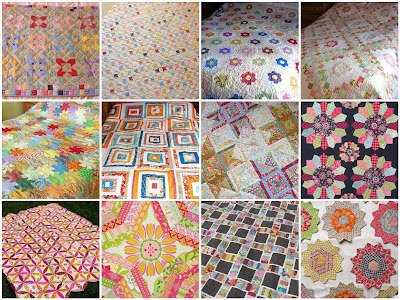 Do you quilt because you find something very satisfying about the process or is the process a means to an end – the end being a finished quilt? Also, how confident are you about your abilities? I already have more quilts that I know what to do with (and I’m sure that having them piled around the house must most definitely be fire hazard) and as I can’t stop making them, for me it is probably about the process. The maths, choosing the fabric, pressing it ready for cutting, cutting it into smaller pieces and then very carefully sewing the pieces back together. I guess for some the repetition would make them want to poke themselves in the eyes with a sharp stick but I love the repetition, the project being all consuming, and the meditative benefits. I am also pretty fortunate that i am not intimidated by very much (only curved seams!!! ), I think because I am naive enough to think that i can actually pull just about anything off if I work hard enough at it. Much more importantly though, the quilts that are my absolute favourites (and the ones I would grab and save if my house was on fire!) are the ones that have taken hours in the planning, the ones that i have painstakingly hand stitched or have challenged me in some way. Those are the ‘special’ ones that will be treasured forever.